forgetfullness | Troy C. Wagstaff aka CallahanWriter Blog: Topics of interest include Western Historical (1865-1899) Topics. Additionally inspirational Christian and Fibromyalgia interests. I want to write about one of the other symptoms of fibromyalgia. It is called fibro . . . um, you know, um, its . . . where you know what you want to say but can’t think of the right word. You know, it’s where you know what the word is, you know what the word means and you know how to use it. You can describe what it means but you can’t think of the word. I want to write today about fibro- . . . it’s where you can’t remember the word . . . fibro-whatchamacallit but you know it’s the right word. 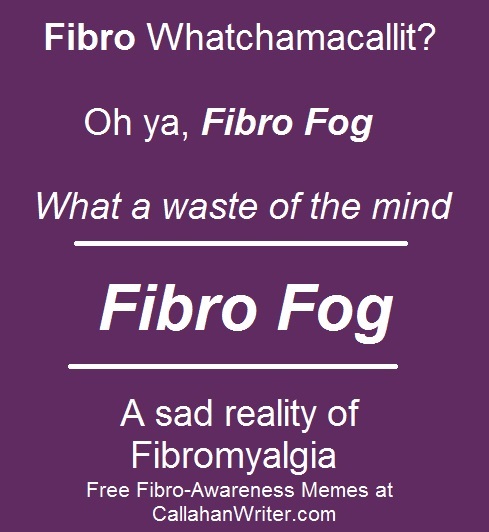 Oh ya, its fibro fog. Fibro fog is more than forgetting words or names. Fibro fog gets in the way of remembering or helps you to forget common and simple tasks. When I try to describe fibro pain symptoms to someone who doesn’t have fibromyalgia it is hard for most people to understand the pain and the constant flu-like symptoms and the over all malaise. I think more people can understand fibro fog better than fibro pain. See if you can relate to these scenarios? Have you ever spent a half hour looking for you glasses only to realize they were on your head? Have you ever looked for your glasses only to find that they are on and you didn’t realize it? Some things are just to embarrassing to admit to. Have you ever gone into a room to get something and while looking around for it you realize that you don’t know what your looking for? Have you every sent your kids throughout the house to hunt for lost car keys only to have your children point out the car keys are in your left hand? These scenarios are just a sample of what fibro fog is like. It is more than forgetting. Fibro fog can make you more easily confused, harder to learn things and it can be harder to concentrate. Here is another exacerbating issue of fibro fog, one of the symptoms that bothers me the most. My chronic daily pain will spike and I go through various rituals to fight the pain. Sometimes I’ll put the heating pad on my back and recline in my easy chair. I practice deep breathing exercises and then thirty minutes later I realize I forgot to turn the heating pad on. Other times I will put a blanket on, remember to turn the heating pad on and a while later realize I forgot to take my pain meds. If you’re in such terrific pain, how could forget to take your pain meds? I do, more often that you might believe. Sometimes, if you’re too despondent with fibromyalgia and its myriad of pain and symptoms the fibro fog can make you feel dumb. I hope that people who read this little article on fibro fog will understand how complex fibro is and if it frustrates you to know someone who has fibromyalgia, just think how this illness affects us. We can plan from one minute to the next. We can be happy one moment and despondent the next. We can be ready to go one moment and in a flare up the next. The pain is awful and the fog just makes a bad thing worse.